As a tester, I try to represent the interests of users. Saying the user, in the singular, feels like a trap to me. There are usually lots of users, and they tend to have diverse and sometimes competing interests. I’d like to represent and highlight the interests of users that might have been forgotten or overlooked. There’s another trap, though. As Cem Kaner has pointed out, it’s worth remembering that practically everyone else on the team represents the interests of end users in some sense. “End users want this product in a timely way at a reasonable price, so let’s get things happening on schedule and on budget,” say the project managers. “End users like lots of features,” say the marketers. “End users want this specific feature right away,” say the sales people. “End users want this feature optimized like I’m making it now,” say the programmers. I’d be careful about claiming that I represent the end user—and especially insinuating that I’m the only one who does—when lots of other people can credibly make that claim. Meanwhile, I aspire to test and find problems that threaten the value of the product for anyone who matters. That includes anyone who might have an interest in the success of the product, like managers and developers, of course. It also includes anyone whose interests might have been forgotten or neglected. Technical support people, customer service representatives, and documentors spring to mind as examples. There are others. Can you think of them? People who live in other countries or speak other languages, whether they’re end users or business partners or colleagues in remote offices, are often overlooked or ignored. All of the people in our organization play a role in assuring quality. I can assure the quality of my own work, but not of the product overall. 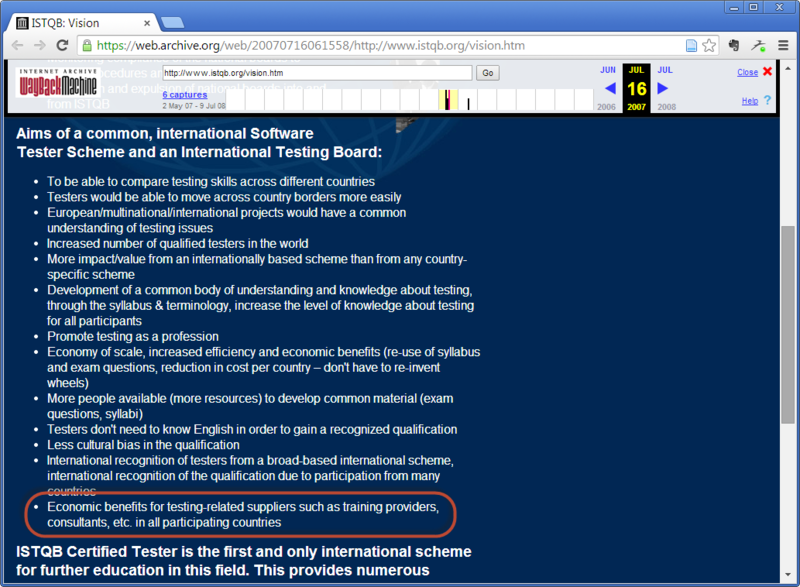 For that reason, it seems inappropriate to dub myself and my testing colleagues as “quality assurance”. The “quality assurance” moniker causes no end of confusion and angst. Alas, not much has changed over the last 35 years or so: no one, including the most of the testing community, seems willing to call testers what they are: testers. That’s a title I believe we should wear proudly and humbly. Proudly, because we cheerfully and diligently investigate the product, learning deeply about it where most others merely prod it a little. Humbly, because we don’t create the product, design it, code it, or fix it if it has problems. Let’s honour those who do that, and not make the over-reaching claim that we assure the quality of their work. I hear a lot from testers who discover problems late in development, and who get grief for bringing them up. On one level, the complaints are baseless, like holding an investigate journalist responsible for a corrupt government. On the other hand, there’s a way for testers to anticipate bad news and reduce the surprises. Try producing a product coverage outline and a risk list. A product coverage outline is an artifact (a mind map, or list, or table) that identifies factors, dimensions, or elements of a product that might be relevant to testing it. Those factors might include the product’s structure, the functions it performs, the data it processes, the interfaces it provides, the platforms upon which it depends, the operations that people might perform with it, and the way the product is affected by time. (Look here for more detail.) Sketches or diagrams can help too. As you learn more through deeper testing, add branches to the map, or create more detailed maps of particular areas. Highlight areas that have been tested so far. Use colour to indicate the testing effort that has been applied to each area—and where coverage is shallower. A risk list is a list of bad things that might happen: Some person(s) will experience a problem with respect to something desirable that can be detected in some set of conditions because of a vulnerability in the system. Generate ideas on that, rank them, and list them. “The testing is going well.” Does this mean the product is in good shape, or that we’re obtaining good coverage, or finding lots of bugs? “The testing is going badly.” The product is in good shape? Testing is blocked? We’re noting lots of bugs erroneously? People replied offering their interpretations. That wasn’t too surprising. Their interpretations differed; that wasn’t too surprising either. I was more surprised at how many people seemed to believe that there was a single basis on which we could say “the testing is going well” or “the testing is going badly”—along with the implicit assumption that people would automatically understand the answer. To test is—among many other things—to construct, edit, narrate, and justify a story. Like any really good story, a testing story involves more than a single subject. A excellent, expert testing story has at least three significant elements, three plot lines that weave around each other like a braid. Miss one of those elements, and the chance of misinterpretation skyrockets. I’ve talked about this before, but it seems it’s time for a reminder. In Rapid Software Testing, we emphasize the importance of a testing story with three strands, each of which is its own story. We must tell a story about the product and its status. As we have tested, we have learned things about the product: what it is, what it does, how it works, how it doesn’t work, and how it might not work in ways that matter to our various clients. The overarching reason that most clients hire testers is to learn about problems that threaten the value of the product, so bugs—actual, manifest problems—tend to lead in the product story. Risks—unobserved but potential problems—figure prominently in the product story too. From a social perspective, good news about the product is easier to deliver, and it does figure in a well-rounded report about the product’s state. But it’s the bad news—and the potential for more of it—that requires management attention. We must tell a story about the testing. If we want management to trust us, our product story needs a warrant. Our product story becomes justified and is more trustworthy when we can describe how we configured, operated, observed, and evaluated the product. Part of this second strand of the testing story involves describing the ways in which we recognized problems; our oracles. Another part of this strand involves where we looked for problems; our coverage. It’s important to talk about what we’ve covered with our testing. It may be far more important to talk about what we haven’t covered yet, or won’t cover at all unless something changes. Uncovered areas of the test space may conceal bugs and risks worse than any we’ve encountered so far. Since we have limited time and resources, we must make choices about what to test. It’s our responsibility to make sure that our clients are aware of those choices, how we’re making them, and why we’re making them. We must highlight potentially important testing that hasn’t been done. When we do that, our clients can make informed decisions about the risks of leaving areas of the product untested—or provide the direction and resources to make sure that they do get tested. We must tell a story about how good the testing is. If the second strand of the testing story supports the first, this third strand supports the second. Here it’s our job to describe why our testing is the most fabulous testing we could possibly do—or to the degree that it isn’t, why it isn’t, and what we need or recommend to make it better. A key element in this third strand of the testing story is testability. Anything that makes testing harder, slower, or weaker gives bugs more time and more opportunity to survive undetected. Managers need to know about problems that impede testing, and must make management decisions to address them. As testers, we’re obliged to help managers make informed decisions. On an unhappy day, some time in the future, when a manager asks “Why didn’t you find that bug?”, I want to be able to provide a reasonable response. For one thing, it’s not only that I didn’t notice the bug; no one on the team noticed the bug. For another, I want to be able to remind the manager that, during development, we all did our best and that we collaboratively decided where to direct our attention in testing and testability. Without talking about testing-related issues during development, those decisions will be poorly informed. And if we missed bugs, I want to make sure that we learn from whatever mistakes we’ve made. Allowing issues to remain hidden might be one of those mistakes. In my experience, testers tend to recognize the importance of the first strand—reporting on the status of the product. It’s not often that I see testers who are good at the second strand—modeling and describing their coverage. Worse, I almost never encounter test reports in which testers describe what hasn’t been covered yet or will not be covered at all; important testing not done. As for the third strand, it seems to me that testers are pretty good at reporting problems that threaten the value of the testing work to each other. They’re not so good, alas, at reporting those problems to managers. Testers also aren’t necessarily so good at connecting problems with the testing to the risk that we’ll miss important problems in the product. Testers: when people ask “How is the testing going?”, they may be asking about any of the three strands in the testing story. When we don’t specify what we’re talking about, and reply with vague answers like “the testing is going well”, “the testing is going badly”, the person asking may apply the answer to the status of the product, the test coverage, or the quality of the testing work. The report that they hear may not be the report that we intended to deliver. To be safe, even when you answer briefly, make sure to provide a reply that touches on all three strands of the testing story. And you can add things to this list too. Okay, so maybe it’s not so easy to remember. But that’s what it would mean to automate the testing. Use tools? Absolutely! Tools are hugely important to amplify and extend and accelerate certain tasks within testing. We can talk about using tools in testing in powerful ways for specific purposes, including automated (or “programmed“) checking. Speaking more precisely costs very little, helps us establish our credibility, and affords deeper thinking about testing—and about how we might apply tools thoughtfully to testing work. Just like research, design, programming, and management, testing can’t be automated. Trouble arises when we talk about “automated testing”: people who have not yet thought about testing too deeply (particularly naïve managers) might sustain the belief that testing can be automated. So let’s be helpful and careful not to enable that belief. A junior tester relates some of the issues she’s encountering in describing her work. It’s not that I don’t just break stuff; I don’t break stuff at all. The stuff that I’ve given to test is what it is; if it’s broken, it was broken when I got it. If I break anything, consider what my colleague James Bach says: I break dreams; I break the illusion that the software is doing what people want. And when somebody doesn’t understand what a tester does, these are some of the metaphors upon which I can start a conversation. These are some things that, in my testing work, I am or that I aspire to be. I’m a research scientist. My field of study is a product that’s in development. I research the product and everything around it to discover things that no one else has noticed so far. An important focus of my research is potential problems that threaten the value of the product. Other people—builders and managers—may know an immense amount about the product, but the majority of their attention is necessarily directed towards trying to make things work, and satisfaction about things that appear to work already. As a scientist, I’m attempting to falsify the theory that everything is okay with the product. So I study the technologies on which the product is built. I model the tasks and the problem space that the product is intended to address. I analyze each feature in the product, looking for problems in the way it was designed. I experiment with each part of the product, trying to disprove the theory that it will behave reasonably no matter what people throw at it. I recognize the difference between an experiment (investigating whether something works) and a demonstration (showing that something can work). I’m a social scientist. I’m a sociologist and anthropologist, studying how people live and work; how they organize and interact; how things happen in their culture; and how the product will help them get things done. That’s because a product is not merely machinery and some code to make it work. A product fits into society, to fulfill a social purpose of some kind, and humans must repair the differences between what machines and humans can do. Thus testing requires a complex social judgement—which is much more than a matter of making sure that the wheels spin right. (I am indebted to Harry Collins for putting this idea so clearly.) What I’m doing has hard-science elements (just as anthropology has a strong biological component), but social sciences don’t always return hard answers. Instead, they provide “partial answers that might be useful”. (I am indebted to Cem Kaner for putting this idea so clearly.) As a social scientist, I strive to become aware of my biases so that I can manage them, thereby addressing certain threats to the validity of my research. So, I use and interact with the product in ways that represent actual customers’ behaviour, to discover problems that I and everyone else might have missed otherwise. I gather facts about the product; how it fits into the tasks that users perform with it, and how people might have to adapt themselves to handle the things that the product doesn’t do so well. I’m a tool user. I’m always interacting with hardware, software, and other contrivances that help me to get things done. I use tools as media in the McLuhan sense: tools extend, enhance, intensify, enable, accelerate, amplify my capabilities. Tools can help me set systems up, generate data, and see things that might otherwise be harder to see. Tools can help me to sort and search through data. Tools can help me to produce results that I can compare to my product’s results. Tools can check to help me see what’s there and what might be missing. Tools can help me to feed input to the product, to control it, and to observe its output. Tools can help me with record-keeping and reporting. Sometimes the tools I’ve got aren’t up to the task at hand, so I use tools to help me build tools—whereupon I am also a tool builder. I’m aware of another aspect of McLuhan’s ideas about media: when extended beyond their original or intended capacity, tools reverse into producing the opposite of their original or intended effects. I’m an investigative reporter. My beat is the product and everything and everyone around it. I ask the who, what, where, when, why, and how questions that reporters ask, and I’m continually figuring out and refining the next set of questions I need to ask. I’m interacting with the product myself, to learn all I can about it. I’m interviewing people who are asking for it, the people are who building it, and other people who might use it. I’m telling a story about what I discover, one that leads with a headline, begins with a summary overview and delves into to more detail. My story might be illustrated with charts, tables, and pictures. My story is truthful, but I realize the existence of different truths for different people, so I’m also prepared to bring several perspectives to the story. There are other metaphors, of course. These are the prominent ones for me. What other ones can you see in your own work? Expected: “Total” field should update and display correct result. Actual: “Total” field updates and displays incorrect result. Come on. When you write a report like that, can you blame people for thinking you’re a little slow? Or that you’re a bureaucrat, and that testing work is mindless paperwork and form-filling? Or perhaps that you’re being condescending? It is absolutely important that you describe a problem in your bug report, and how to observe that problem. In the end, a bug is an inconsistency between a desired state and an observed state; between what we want and what we’ve got. It’s very important to identify the nature of that inconsistency; oracles are our means of recognizing and describing problems. But in the relationship between your observation and the desired state, the expectation is the middleman. Your expectation is grounded in a principle based on some desirable consistency. If you need to make that principle explicit, leave out the expectation, and go directly for a good oracle instead. A few weeks ago, I posted a Very Short Blog Post on the bare-bones basics of testability. Today, I saw a very good post from Adam Knight talking about telling the testability story. Adam focused, as I did, on intrinsic testability—things in the product itself that it more testable. But testability isn’t just a product attribute. In Heuristics of Testability (material we developed in a session of Rapid Software Testing Intensive Online), James Bach shows that testability is a set of relationships between product (“intrinsic testability”); project (“project-related testability”); tester (“subjective testability”); what we want from the product (“value-related testability”); and how we know what we know and what we need to know (“epistemic testability”). Be sure of this: anything that makes testing harder or slower gives bugs more time or more opportunities to hide. In telling an expert and compelling story of our testing, it’s essential to identify and address things that make it harder to understand the product we’ve got—things that help to increase the risk that it won’t be the product our clients want.